A make-your-own pizza dinner party was the scene when we popped the cork on this bottle from a small winery in Suisun Valley, California. 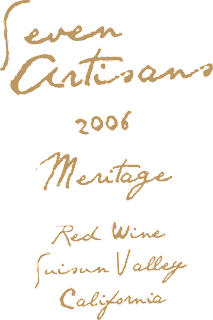 Meritage is America's version of a Bordeaux style blend (check out our story on Meritage) and this blend is about 90 percent Merlot and 10 percent Cabernet Sauvignon with dashes of Malbec and Petite Verdot. I was hoping for a bit more body from this wine so it would stand up to our pizza creations. The label didn't disclose the percentages of the various grapes, so a didn't realize it was dominated by the mellower Merlot. That being said, it was a very enjoyable wine -- although not the perfect match for pizza. This would be a better match with beef or lamb. It was a light to medium body with flavors of cherry and slight earthiness. I picked this bottle up at Aficionado in Perrysburg on sale. It usually retails for $17.99, which is a nice price for this wine.